Incheon International Airport Corp. said Tuesday that the new terminal at Kuwait International Airport managed by the South Korean operator has officially opened. Kuwait International Airport is wholly owned by the Kuwaiti government, handling some 12 million travelers last year. IIAC was chosen as the operator for the new Terminal 4 through a bidding process in April. It is the first time for a foreign company to operate the Kuwaiti airport. IIAC said it has dispatched 30 officials with relevant expertise since May to prepare for the opening. They added that the opening of the terminal was possible despite heavy rainfall in the region last month that damaged terminal roads, the mooring, taxiway and other facilities, as IIAC managed to normalize the operation within a week. 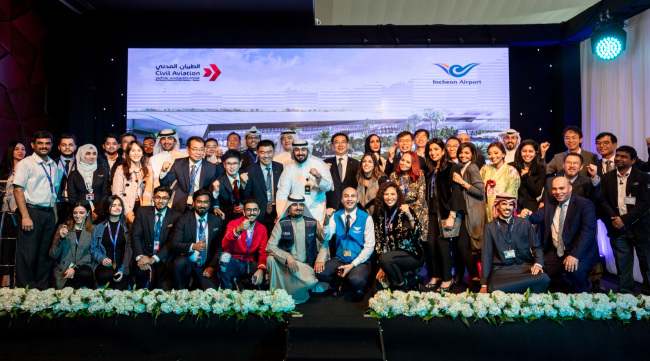 “We will see to it that the terminal of Kuwait International Airport is operated without a hitch and will continue to expand our overseas operation to other regions of the Middle East, eastern Europe, Southeast Asia and Central Asia,” said Chung Il-young, president of IIAC. Spanning an area of 55,000 square meters that includes 14 gates and 2,450 parking spaces, Terminal 4 was designed to syphon away traffic from other terminals.